Product #46634 | SKU 16700 | 0.0 (no ratings yet) Thanks for your rating! 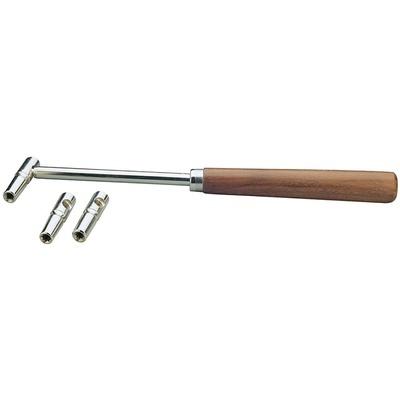 The Piano Tuning Lever Set by K&M consists of a well-made, professional tuning wrench and three different adapters for use with nearly any piano. The wrench provides good leverage with its angled neck and the short, stiff socket has a good feel and gives you control over the tiny movements of tuning pins within the pin-block. Also, the angled neck provides clearance over adjacent pins and the polished wooden handle makes this lever durable and comfortable to use.